Sitting At The Foot of the Mountain: Fig Newtons, Anyone? The parable of the fig tree shows up in an immense teaching on the end of the age. In chapter 21 of Luke, the disciples comment how beautiful the temple in Jerusalem is: "Some of his disciples were remarking about how the temple was adorned with beautiful stones and with gifts dedicated to God. But Jesus said, 'As for what you see here, the time will come when not one stone will be left on another; every one of them will be thrown down.'" Stop for a moment. Can you imagine the disciples' reaction? 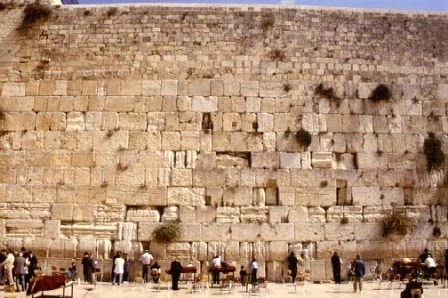 Here they are gazing on a monumental structure--the Second Temple, built by Herod, in all of its beauty. Gaze up at the mighty Temple of God. It is His House. 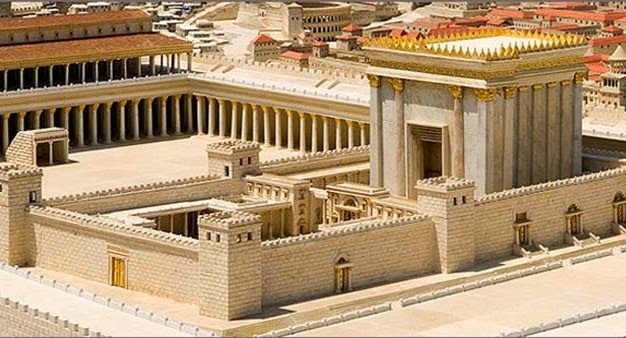 The Jews believed that although He was not limited to any earthly structure, His House on Earth was this temple. Jesus' comments must have stopped the disciples dead in their tracks. How could something so permanent and indwelt by the very Creator Himself come a-tumblin' down? Jericho's walls--yes. That was a pagan city. Sodom and Gomorrah--yes. That was a place of sin. But Jerusalem? The City of David? What's interesting is that before Jesus launches into His discussion, the disciples and Him had witnessed a widow putting her offering into the Temple box: "As Jesus looked up, he saw the rich putting their gifts into the temple treasury. He also saw a poor widow put in two very small copper coins. 'Truly I tell you,' he said, 'this poor widow has put in more than all the others. All these people gave their gifts out of their wealth; but she out of her poverty put in all she had to live on.'" Jesus is setting up a contrast here. A widow, with so very little, gives a fortune in Heaven's eyes. She puts her all into that box. First, all of her love: She serves a mighty God, Who provides for her day by day, and loves her deeply and she knows that so well. She puts in all of her faith: She knows that whatever she has, is ultimately God's, and she gives it back to Him, knowing that God's "manna" and "quail" will never cease. Finally, she puts in all of herself: She herself is an offering, and knows that God loves someone who holds nothing back for Him. She has no fear, just gratitude and love for her God. In the larger scheme of things, her coins will not even fund a minute of Temple activities. In Heaven's scheme, however, her gift will move the Kingdom of God one step further because it shows real faith in action. Her faith is a pleasing sacrifice to God. So, Jesus, with the widow wandering away, and the disciples being wowed by the Temple, (probably forgetting this little moment of what true worship is) Jesus makes His profoundly disturbing statement about the Temple's future. He lists in Luke 21 all of the signs that will herald this astonishing event of the Temple's destruction. Jesus tells in no uncertain terms about what will happen in 70 AD. The Romans will put down a rebellion of the Jews in the harshest terms possible: mass murder of the Jews and the destruction of the Temple, stone by stone. He then warns them, that like the fig tree and other trees, whose leaves herald the arrival of summer, they must read the signs to be prepared for what is to come. Jesus doesn't leave His disciples ignorant of the future. God promised after the fall of man that He would never stop the seasons--that the earth would continue: "As long as the earth endures, seed time and harvest, cold and heat, summer and winter, day and night will never cease." (Gen. 8:22) He promises this covenantially with Noah and with all of us. The signs of the seasons will allow mankind to plant, water and harvest all in the right sequence, insuring survival. If we are diligent and watch, we will act accordingly. The same holds for the signs as to this coming catastrophe. The disciples are being told what "leaves" to look for, and how each successive "sprouting" draws the day of destruction even closer. How should the disciples respond? After using the parable of the fig tree, He says that "this generation" will not pass away until all has come about. He then focuses on what is truly permanent: "Heaven and earth will pass away, but my words will never pass away." The Temple...Roman rule...The Jewish homeland...The sacrificial system...The dispersion of the Jews to faraway lands...The near future will rain down like a deluge, like a second Flood, to sweep away the world of the disciples and their generation. Wow. "Be always on the watch." Look for the little buds on the branches under gray winter skies. Look for the little buds slowly starting to unfurl as the days grow warmer. Look for the tender green leaves. Look. Watch. Pray. Don't run from the signs, but embrace them, knowing that God will stand by you. Even if you have very little in this world--don't forget the widow--you have God and His provision. Live by putting her kind of faith into action. The parable also addresses where we put our faith. Do we put our faith in our grand monuments, churches and cathedrals? Beautiful, yes, but what was more beautiful to Jesus? The Temple in all its glory, or the widow giving everything she had? What furthered the Kingdom of God? The Temple or the widow? We love our man-made structures, for they testify to man's greatness. But the Kingdom of God is based on His love for us. We are in covenant with Him: He is our Shepherd and we are the sheep of His hand. Everything around us may fall, but His love and His word stands forever. We are now the temple of God. The veil tore on Good Friday. We can now enter in to God's Holiest of Holies by the blood of Christ. But, God also left the Temple to enter into us: "Don't you know that you yourselves are God's temple and that God's Spirit dwells in your midst?" (1 Cor. 3:16). So, what is permanent in man's eyes is fleeting in the larger picture of the Kingdom. We are His temple, His dwelling place. We look to the signs of the times and understand the direction things are going, but we stand on His promise to never leave nor forsake us. This temple, this dwelling place of God is you. May this Good Friday with its sadness and sacrifice burst into Resurrection Sunday, where the stone is rolled away and we are set free from the fear of sin and death! Hallelujah!